U.S. Rep. Scott Tipton, R-Cortez, greets people in Westcliffe during a celebration for the towns 125th anniversary on Saturday. Titpon held town hall meetings in Westcliffe and Pueblo. 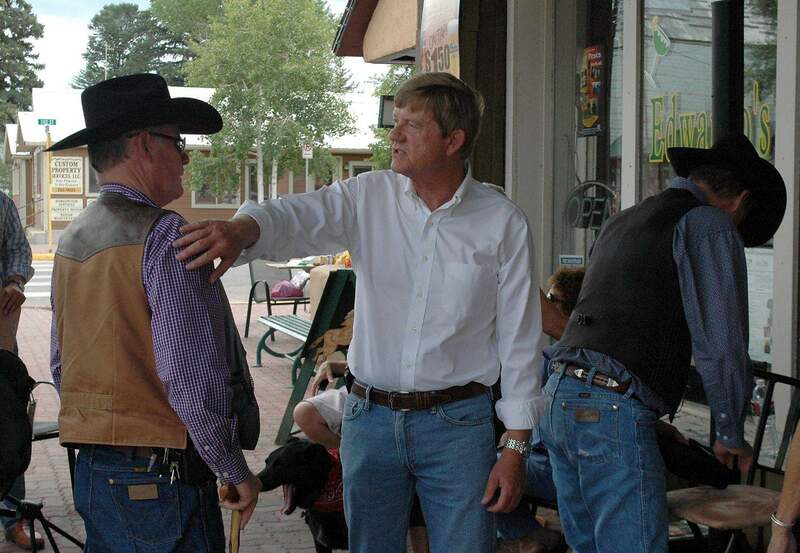 WESTCLIFFE  U.S. Rep. Scott Tipton has learned from the past. In 2010, he won his seat in Congress from Rep. John Salazar, who took criticism for holding too few public events during a summer that saw the early days of the tea party and angry town hall meetings across the country. Tipton, R-Cortez, faces re-election in November, and on Saturday, he held his 45th and 46th town hall meetings since taking office. No. 45 happened in Westcliffe, a town an hour west of Pueblo that was celebrating its 125th birthday. About 15 people attended, and although it was a quieter, smaller crowd than the raucous events of the 2010 campaign, people still expressed frustration with Congress. Tipton laid much of the blame on the Democratic-controlled Senate. Tipton took a veiled shot at the career experience of his Democratic opponent, Sal Pace. Tipton has served in Congress for a year and seven months, but he has three decades of private sector experience, which puts him in the minority of members of Congress, he said. Pace graduated from Fort Lewis College and worked as an aide for Salazar before winning a seat in the state Legislature. At the Westcliffe town hall, the mostly friendly audience complained to Tipton about the Environmental Protection Agency, the American Civil Liberties Union and the federal health-care law  complaints with which Tipton sympathized. When one man complained that political action committees have too much influence over both parties, Tipton said it was hard to change the system because of First Amendment concerns. Also, some political donors have good ideas, he said, citing the Farm Bureau and Colorado Cattlemens Association as examples. Im not a career guy. Ive been here now for one year and seven months. I spent 33 years in the private sector sitting in your chair, Tipton said. Later Saturday, Tipton shook hands on Westcliffes Main Street at the towns birthday celebration and held another town hall in Pueblo. The campaign has been low-key so far. Pace also drew a modest crowd this week, speaking to about 20 Democrats on Thursday at an Alamosa restaurant.